I was invited to try out The Artist’s Way Toolkit by Julia Cameron. I was excited to delve into an interactive learning experience. It was simple and straightforward. I had to commit to myself to write daily morning pages (beautiful, but not realistic for a mother of two under five), take myself on dates, and journal. I love the concept, giving yourself time to be creative in your own mind. Sadly I had a hard time writing every morning. When a toddler wakes up you cannot tell them to stay in bed until you have three uninterrupted pages written, and peacefully purge all of the brilliance in your mind. I did like the concept of long-hand writing. So my morning pages turned into afternoon pages as I snuck away into the bathroom for a moment of peace to write. There is something about writing in a journal that is so private, whereas, I was very hesitant to write in my artists’ toolkit online. It just did not feel private. I didn’t know if three years from now I would be able to log in and turn back to see where I was at this point in my life. 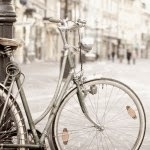 As much as blogging is a public exposure, it is my public exposure. I am in charge and what I write is publically read, what I write in my journal, I am just not comfortable writing it online. 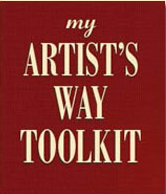 Please join me in the continuing conversation at BlogHer about The Artist’s Way Toolkit.